© AFP/Getty Images Hondurans head towards the US from San Pedro Sula in vans and trucks on 13 October. 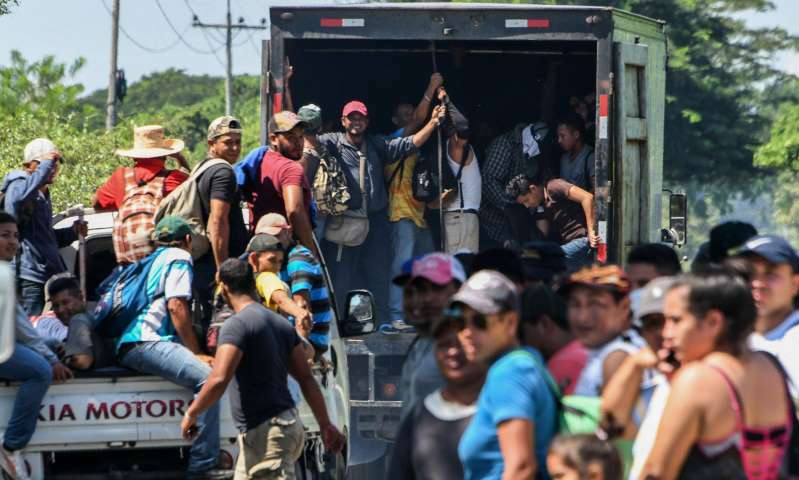 A group of more than 1,600 Honduran migrants who are attempting to reach the US border overland have crossed into with Guatemala – despite warnings that they would be turned away at the border. Singing the Honduran national anthem, praying and chanting, “Yes, we can,” the group, who say they are fleeing violence and poverty, crossed the border on Monday afternoon and headed towards the city of Esquipulas. “We are not criminals we are migrants,” said Keilin Umana, a pregnant nurse who told the Associated Press that she had fled her home after receiving death threats from gang-members. The migrant caravan set off from the city of San Pedro Sula on Friday, the day after the US vice-president, Mike Pence, urged the presidents of Honduras, El Salvador and Guatemala to persuade their citizens to stay home. “Tell your people: don’t put your families at risk by taking the dangerous journey north to attempt to enter the United States illegally,” said Pence at a regional security event in Washington DC. The Guatemalan government, which is seeking US support in its controversial attempt to shut down the UN-backed crime fighting force investigating the president and his close allies for corruption, pledged to comply with Pence’s demands and halt the mass migration. About 100 Guatemalan police officers met the caravan at the border, but after a tense standoff of about two hours, the migrants began walking again. The migrant caravan has swelled from 160 to 1,600 since setting out last week from San Pedro Sula, which has become one of the world’s most dangerous cities thanks to a toxic combination of gang and state-sponsored violence, corruption and impunity. The group includes dozens of families with infants and children who hope traveling in numbers will reduce the risk posed by criminal gangs that prey on vulnerable migrants. The passage through Mexico is one of the world’s most perilous migration corridors. This is the second Central American migrant caravan this year. In April, Donald Trump threatened to cut foreign aid after hundreds of people, mainly Hondurans, applied for asylum in the US. Since then, thousands of Central American children have been separated from their parents at the US border as part of an anti-immigration crackdown. But rampant violence and poverty in Central America continues to force people to abandon their homes in search of safety and jobs. Honduras remains one of the most dangerous countries in the world, despite official figures that claim a record-breaking drop in murder rates. Two-thirds of Hondurans live in poverty, with remittances accounting for a fifth of the country’s GDP.